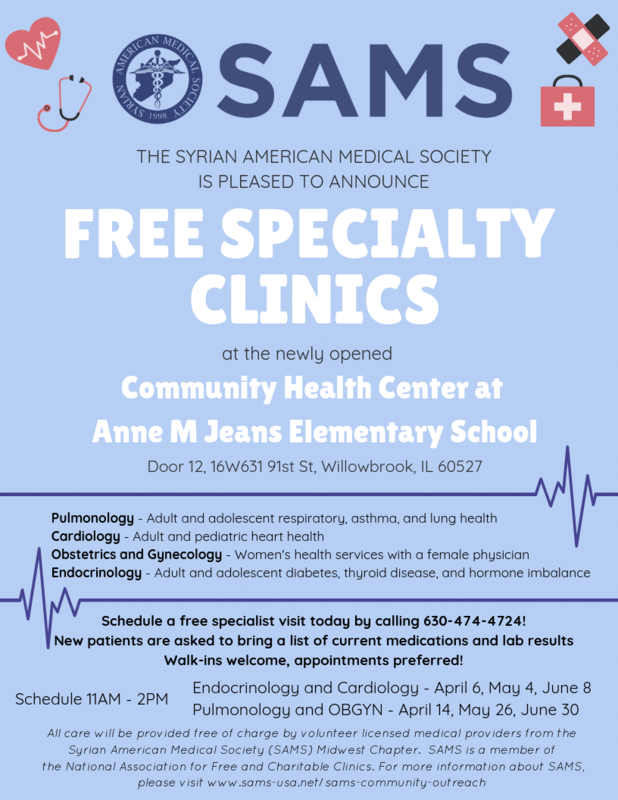 The Syrian American Medical Society (SAMS) is pleased to announce that free specialty clinics will be available at Anne M Jeans Elementary School (Door 12, 16W631 91st St, Willowbrook, IL 60527). Pulmonology: Adult and adolescent respiratory, asthma, and lung health. Cardiology: Adult and pediatric heart health. Obstetrics and Gynecology: Women’s health services with a female physician. Schedule a free specialist visit today by calling 630-474-4724. Patients are asked to bring a list of current medications and lab results. Walk-ins are welcome, appointments are preferred. All carr will be provided free of charge by volunteer licensed medical providers from the Syrian American Medical Society (SAMS) Midwest Chapter. SAMS is a member of the National Association for Free and Charitable Clinics. Fore more information about SAMS, please visit www.sams-usa.net/sams-community-outreach.